In a Nutshell: Listia is an online peer-to-peer marketplace where consumers give away their old clutter and get new products. Members earn credits when they “sell” any items and can redeem them by buying other people’s stuff or donating to a charity. As a way to unlock the value of consumer goods, the site boasts 100+ million trades from over 7 million members in efforts to promote sharing items. Remember when you were in grade school, how lunchtime would roll around, and every kid would open up their lunchbox to reveal what they had? And instead of eating right away, what did most kids do? Barter. Chocolate pudding for a bag of chips. Peanut butter sandwich for two cookies. Grape juice box for a half carton of milk. Kids flat out know how to haggle. Although consumers can’t swap food, Listia lets people tap back into that mentality of getting rid of something they don’t want while getting something new. Instead of auctioning off orange slices or applesauce, the online marketplace is a community where users de-clutter their homes, basements, closets, and garages and give away everyday items in exchange for Listia credits. Simply put, Listia is a peer-to-peer marketplace for trading new and used items. Yep, that’s right, trading only. Just like grade school, no cash or credit card charges are exchanged here. In fact, everything is 100% free. Simple indeed. After creating an account, all users have to do is upload a few photos and write a brief description of the item. After setting the minimum bid amount and shipping options, that item is ready for auction. 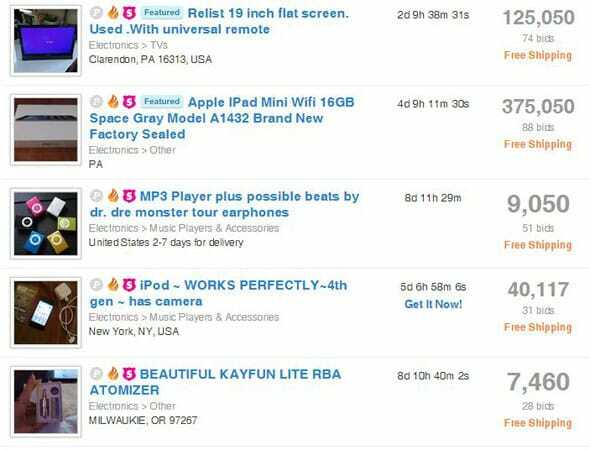 During the auction, other users use “credits” to bid on the item and, as you’d expect, that item is “sold” to the highest bidder. The credits then go directly to the seller who can redeem for other items up for auction. What’s even better is that buying any items here is almost always a huge bargain, allowing people to get items they wouldn’t have enough resources to purchase brand new. On top of using credits to bid on other items, users have the option to “cash out” by exchanging them for a large selection of gift cards and other items. Another popular option is donating credits to one of two featured charities that rotate out every month. Previous charities include Toys for Tots, Make a Wish Foundation, and Goodwill. In fact, Listia members donate more than $2,000 worth of credits to charities every month. Listia co-founder James Fong wanted to sell an old pair of snowboard boots and discovered there was no easy way to give away items that were laying around the house. Gee-Hwan Chuang and James Fong are the Founders of marketplace Listia. He tried a few online services, like Craigslist, but was immediately overwhelmed by emails and people asking a handful of questions. Fong teamed up with Gee Chuang, and together they co-founded Listia in August 2009. Now used by more than 7 million users facilitating more than 100,000 trades a day, Listia is one of the most popular trade-based marketplaces on the web. Although consumers can use online-marketplace giants like eBay and Craigslist to get rid of clutter, Listia offers an alternative way to make space and get new items from others. Users are able to chat with other members and actually see their full profiles. Accounts are verified multiple times, so users can feel safe when they trade with others. Members are also able to post public comments and questions regarding an item up for auction, and other users can jump in and add to the conversation. One of the other big differences? The Listia team is passionate about helping people become comfortable with buying something slightly used instead of buying something new from the store. Listia also has a handy app (available on iOS and Google Play), which makes trading and searching for items on-the-go even easier. A wonderful marketplace for both bargain hunters and people de-cluttering their homes, Listia is easily one of the best resources on the web for trading used items. Users can easily sign up, post an item, and start trading within minutes; there’s no long wait to set up and get started. The community aspect and safety features are a few added bonuses to make trading fun. If consumers have a few items lying around the house that they need to get rid of, or are looking to score a big bargain deal on something they want, Listia is a great online resource to check out and join.